This week, Durham, N.C.-based Indy Week reported that North Carolina's leading education agency was promoting a curious resource for teachers in public schools: the Bill of Rights Institute, a Virginia-based nonprofit founded by the conservative Koch brothers. The Bill of Rights Institute was listed in a presentation by N.C. Superintendent of Public Instruction June Atkinson to a state Senate education committee, which included proposals for the curriculum of "American History I: The Founding Principles," a course mandated by the Republican-controlled legislature in 2011. Indy Week looks at the involvement of the Koch brothers, who launched the Institute in 1999 to distribute conservative-leaning lesson plans and other materials for teaching U.S. history, as well as the involvement of the American Legislative Exchange Council, a Koch-backed conservative policy group. But there's a more direct connection between the Bill of Rights Institute and North Carolina: Art Pope, the North Carolina-based Republican mega-donor, conservative philanthropist and current state budget director for Gov. Pat McCrory (R). 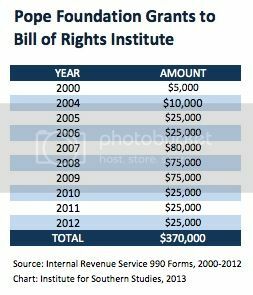 Federal tax records show that Art Pope's family foundation has given at least $370,000 to the Bill of Rights Institute since 2000. The John William Pope Foundation's grants to the Institute have increased as Art Pope himself took a bigger leadership role in the family foundation. This isn't surprising: Pope has worked closely with the Koch brothers for years, funding many of the same organizations and making the invite list for secretive strategy retreats hosted by the Kansas energy billionaires. Until recently, Pope was also chair of the Tea Party advocacy group Americans for Prosperity; Pope's foundation has been the second-largest backer of the Americans for Prosperity Foundation, with the Koch brothers being the largest funders. Pope and his network of groups have been deeply involved in North Carolina school issues, leading the charge for expanding charter schools in the state and taking an active role in a debate in Wake County over the local school system's desegregation policy. A recent lesson plan on gun rights following the Newtown, Conn., elementary school shooting in December included questions referencing popular conservative talking points but only briefly noted the central point of pro-gun control arguments -- that limiting access to guns will curb gun violence. "Some regulations have been criticized as criminalizing the behavior of millions of law-abiding Americans because of the criminal acts of others," the plan said. "Should laws be based on harm/intended harm, or also on the potential to do harm?" A lesson plan on Obama's 2010 health care overhaul challenged students to question whether it was "ultimately unconstitutional." "When we are talking about materials to be used in the classroom, we need to make sure that they align with the curriculum, that they do not show biases, and if they do, that there is a counter to that."